Track and transit sold separately as part 111 0335. 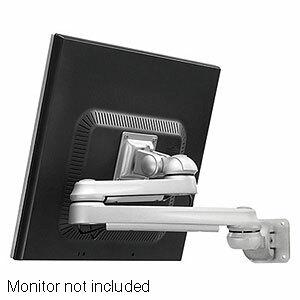 Position a flat panel monitor on the ZIOTEK track system with this 5-jointed display arm. It allows you to position the monitor anywhere within a 2-foot radius of the mount. Even under a full 11-pound load, the aluminum arm moves smoothly with just light pressure. Includes mounting hardware and 75/100mm adapter. Assembly required. Display, cables and track system not included.